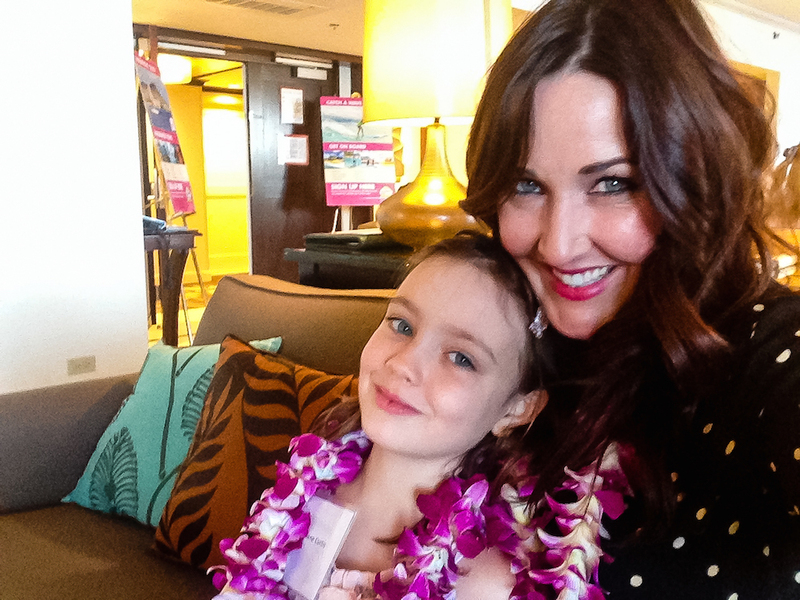 Scarlet and I had the loveliest mother-daughter week in Oahu this past summer. I’d been wanting to share it, but I had a hard drive meltdown and was just able to recover my data, which is such a relief. All her baby pics! Gah! Back your stuff up in like 3 places ladies. 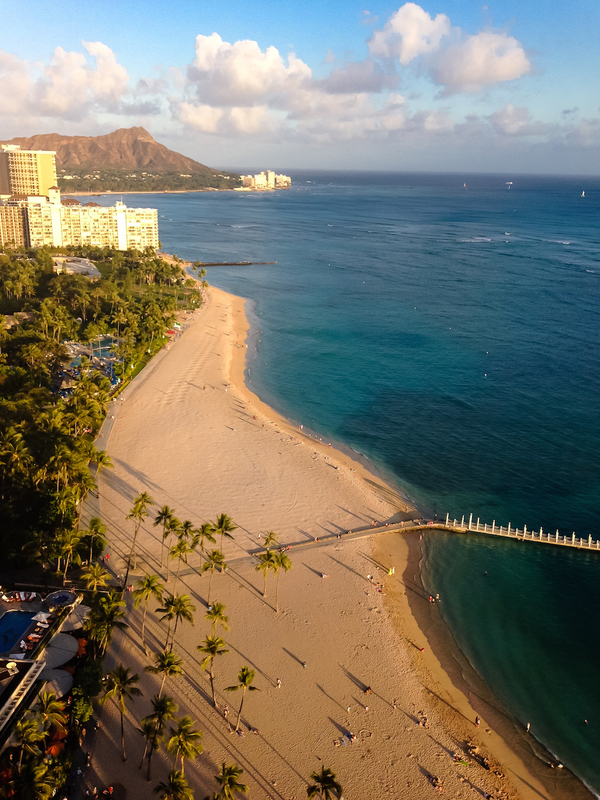 And plan a trip to Hawaii, because right about now doesn’t it sound like heaven? 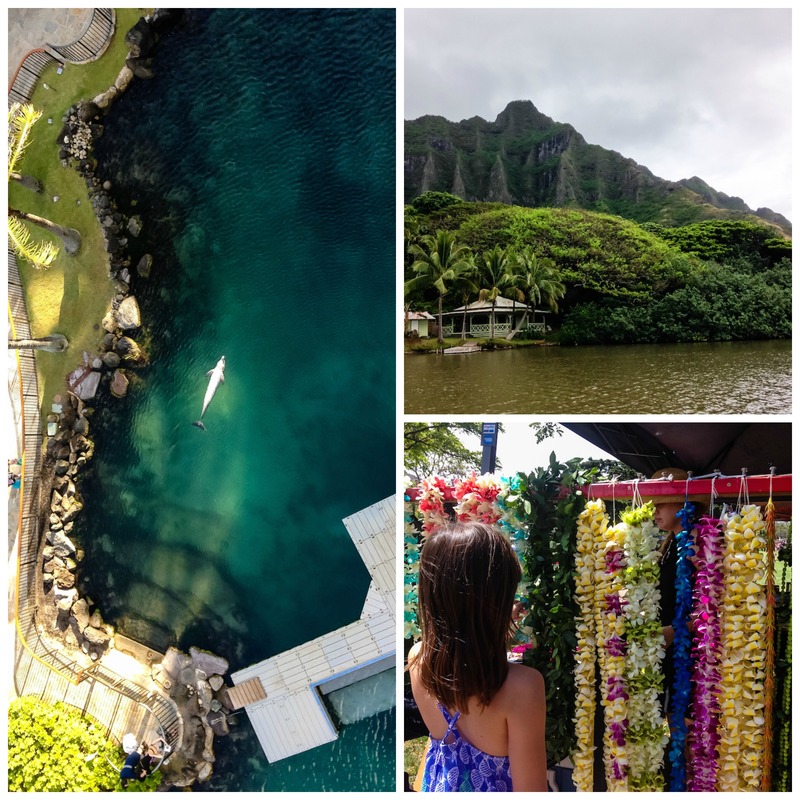 Here’s what we did in Honolulu, Waikiki, and the North Shore of Oahu. 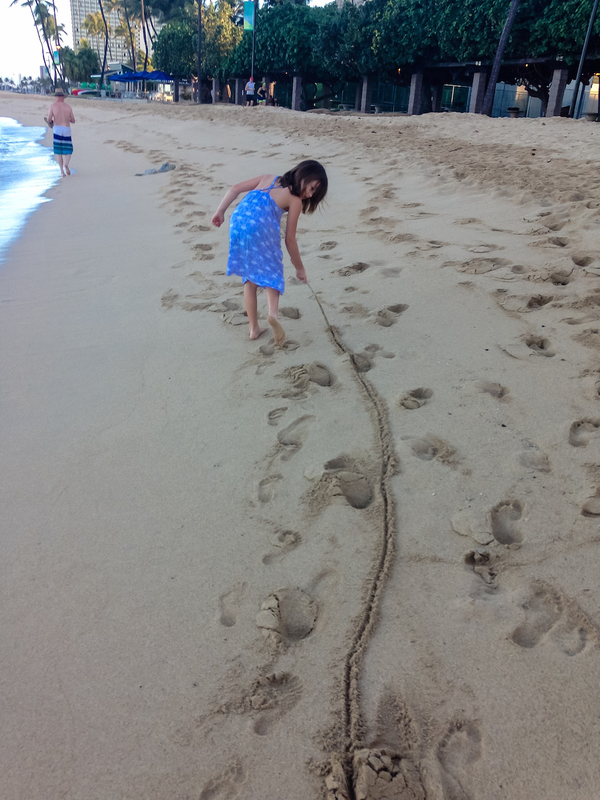 We started off with a long walk in the sand in front of the Outrigger Reef Waikiki Beach Resort. 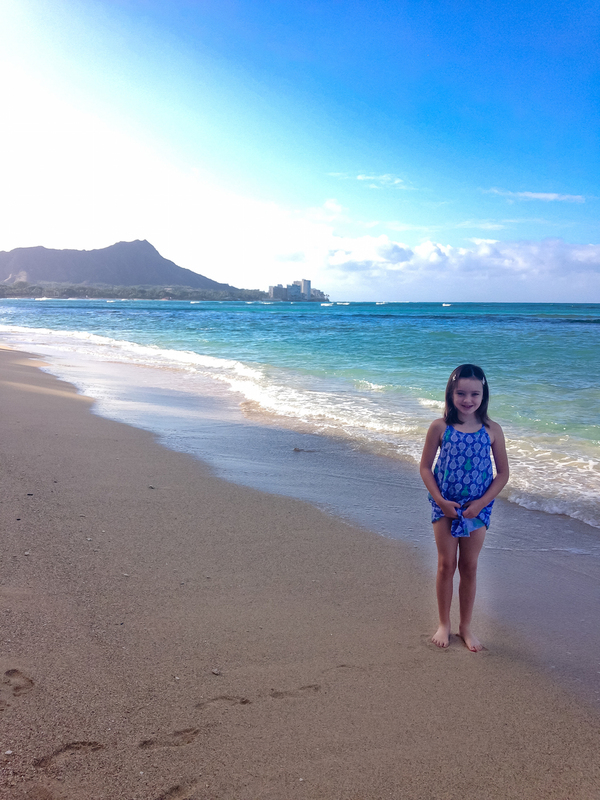 Then we walked over to the Hilton Hawaiian Village where we enjoyed the views of Waikiki Beach and Diamond Head. Then we learned to make leis together. We had a blast. 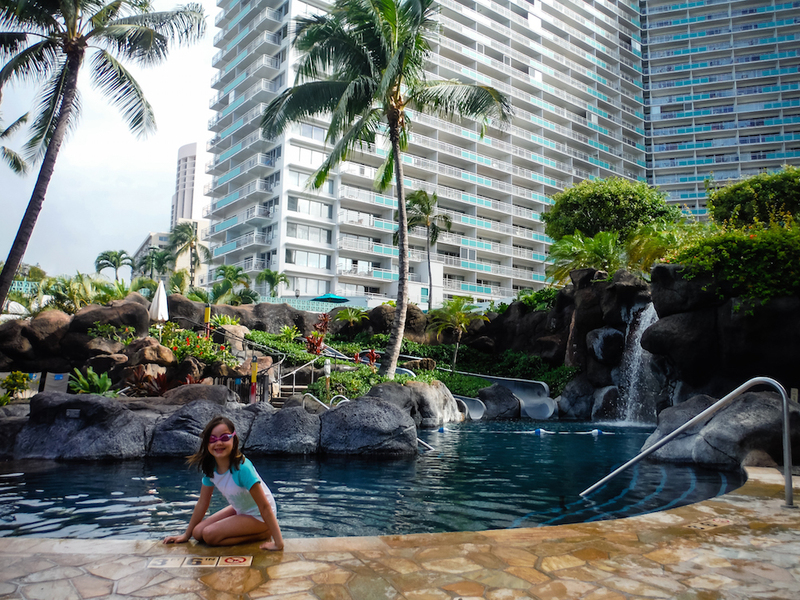 We awoke the next morning and headed to the Embassy Suites Waikiki Beach Walk for a nice breakfast and to relax by the pool. I like the rooms here because they are all suites – great for families, and the view is pretty. From there Scarlet and I decided to take a leisurely walk down Kalākaua Avenue to Kapi’olani park for the Lei Day celebration. 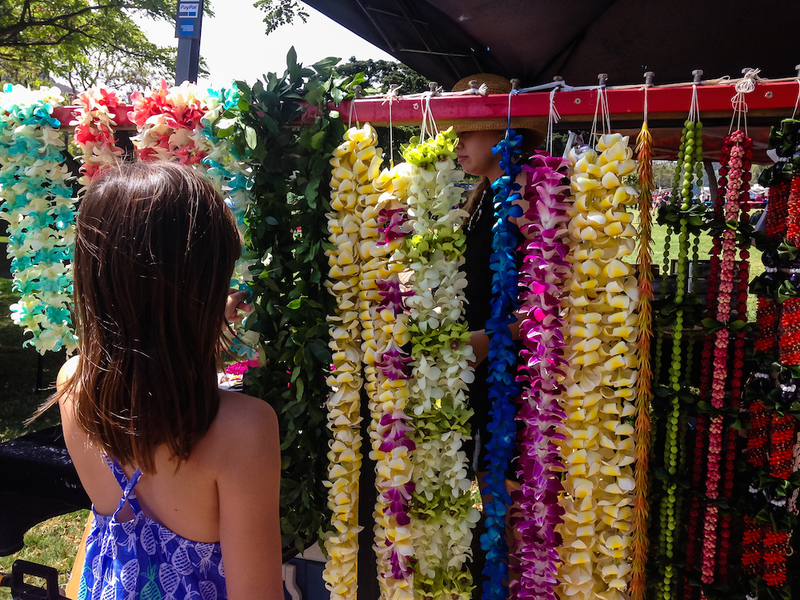 After the Lei Day festival, we hopped in an uber (yes, Honolulu has uber now!) 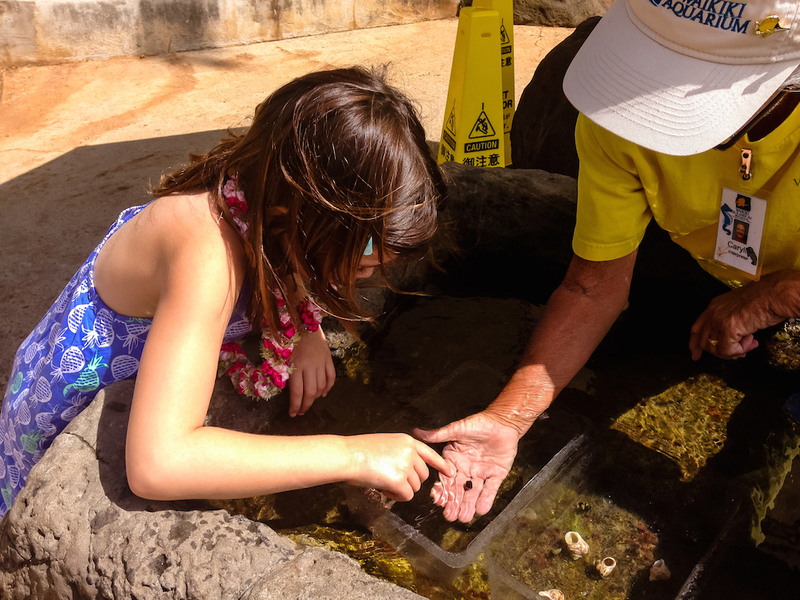 and made a stop at the Waikiki aquarium. 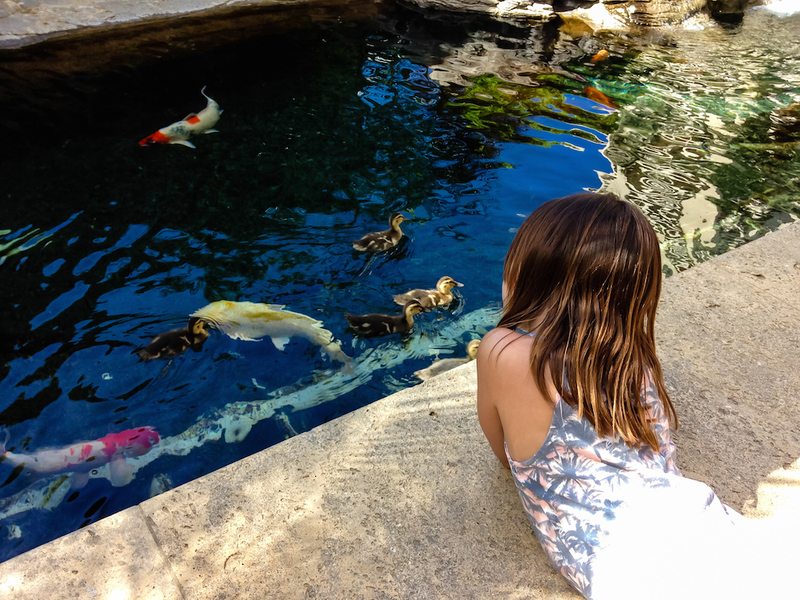 This aquarium is small, yet packed full of fun for a kid. Scarlet is obsessed with aquariums so we visit them pretty much everywhere we go. This time around she wanted to see a humuhumunukunukuapua’a SO BADLY, and she was not disappointed. Also, the aquarium is very intimate, so she got some one-on-one hands-on time in the touch pools. 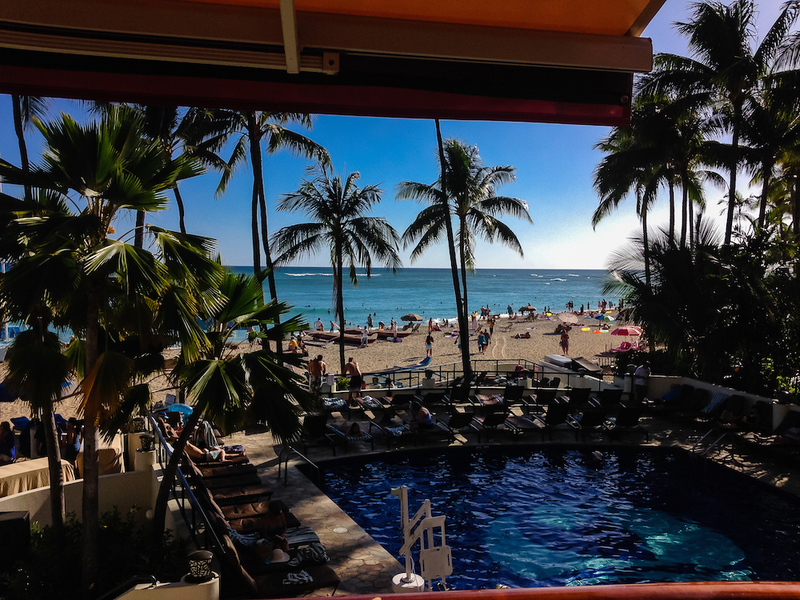 After that, it was off to Duke’s at Outrigger Waikiki for some pretty views, pupus, and a cocktail for mama. In the morning we hopped in our rental car to head to the North Shore. 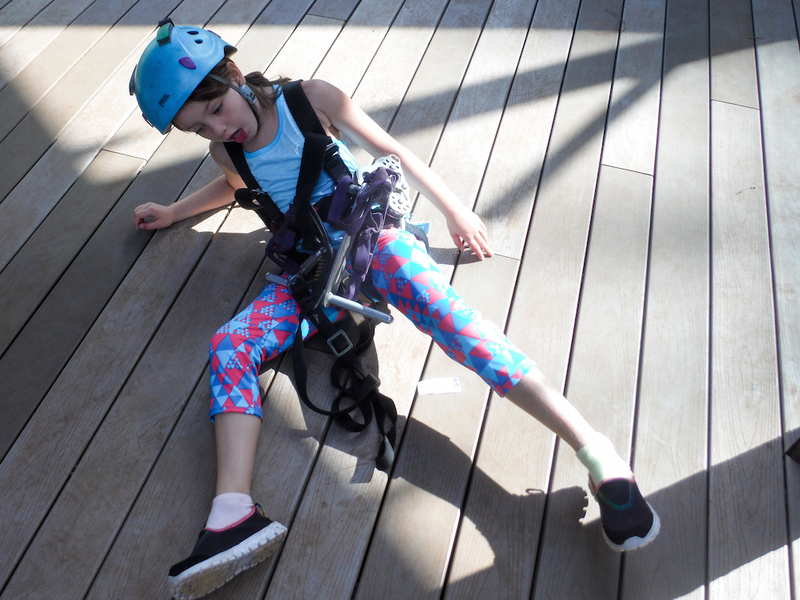 We started out with a plan to go ziplining at CLIMB Works at Keana Farms, as Scarlet is just tall enough to give it a shot. She got all geared up and I was so excited for a day of adrenaline fun in the beautiful Hawaiian wilderness. so we swung on it. 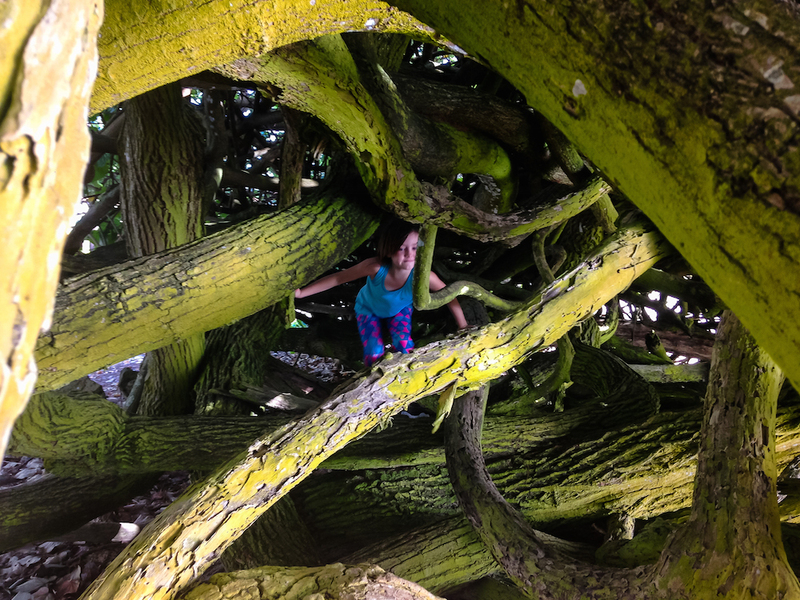 We found a cool tree, so we climbed it. 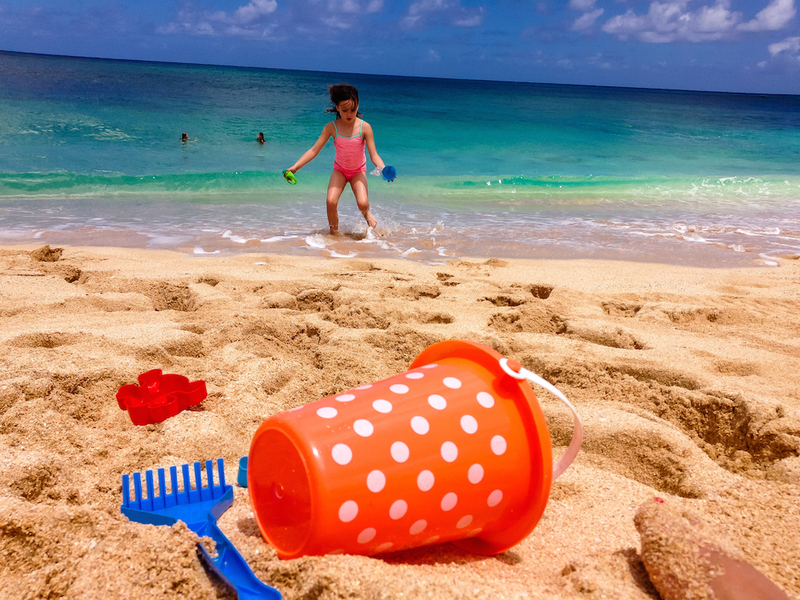 We found some sand toys, so I bought them. 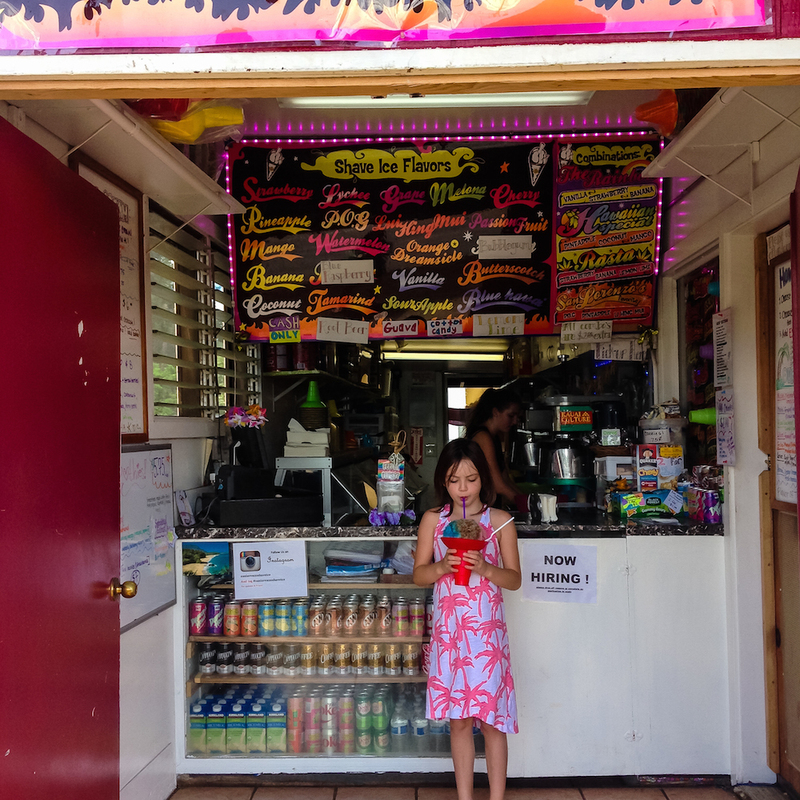 And we found some shave ice, so we ate it. 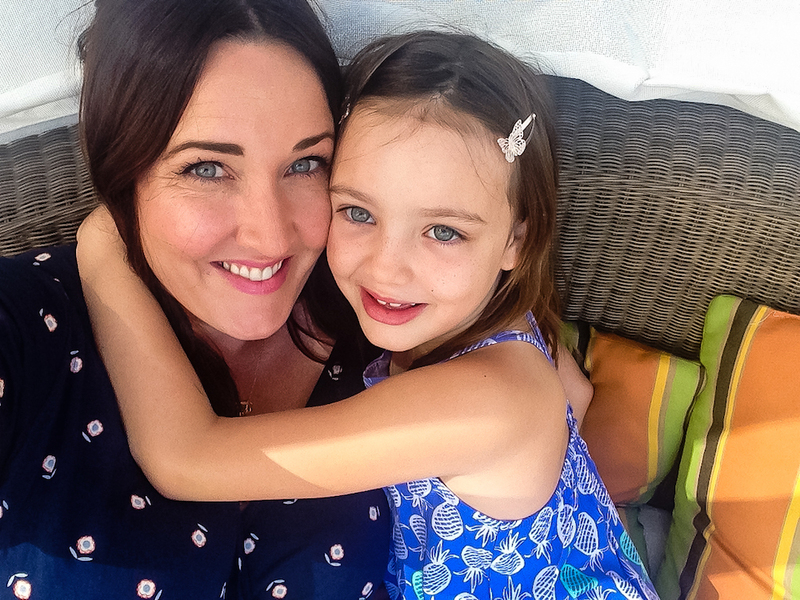 This was pretty much the most perfect afternoon you could ever spend with your 7 year old. Just perfection. In the evening, we headed back up Kalākaua Avenue where the street were closed to cars and open to SPAM! 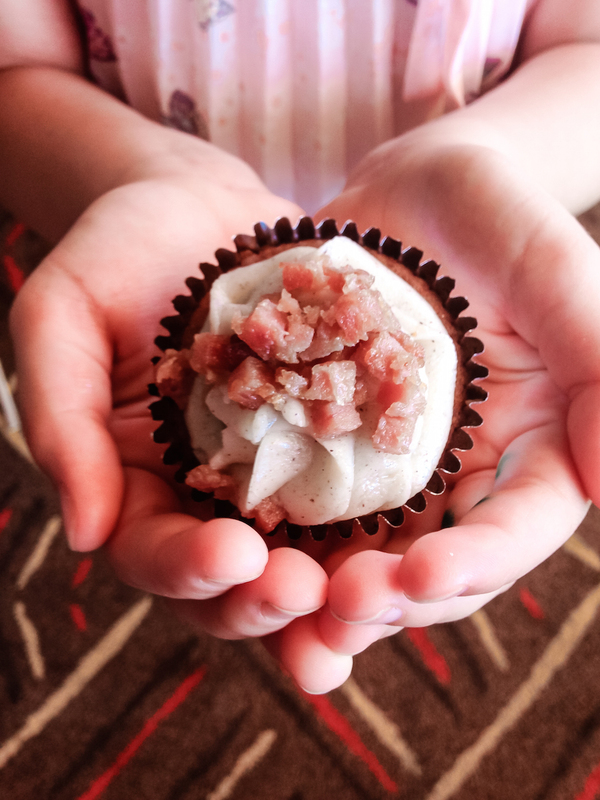 The SPAM JAM brought the island’s favorite food to life in every possible combination, including SPAM Cupcakes. 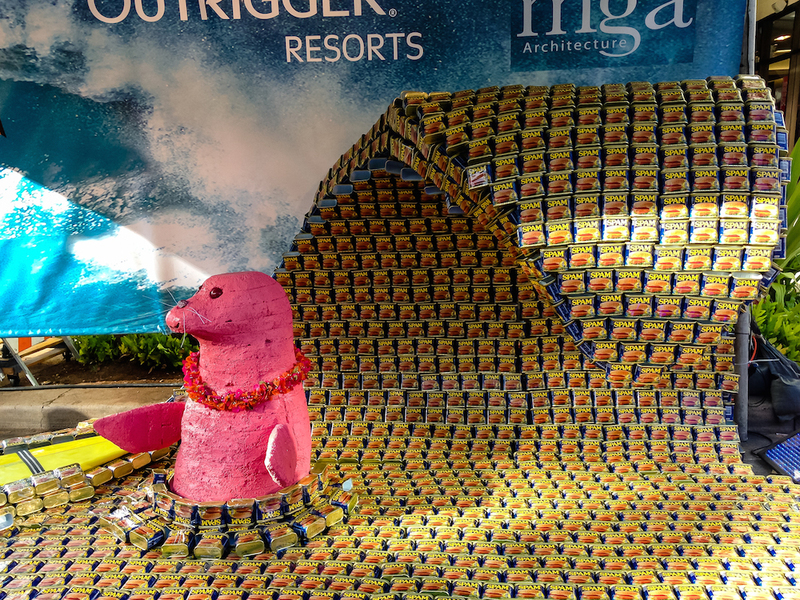 Scarlet snapped this pic of the SPAM wave. 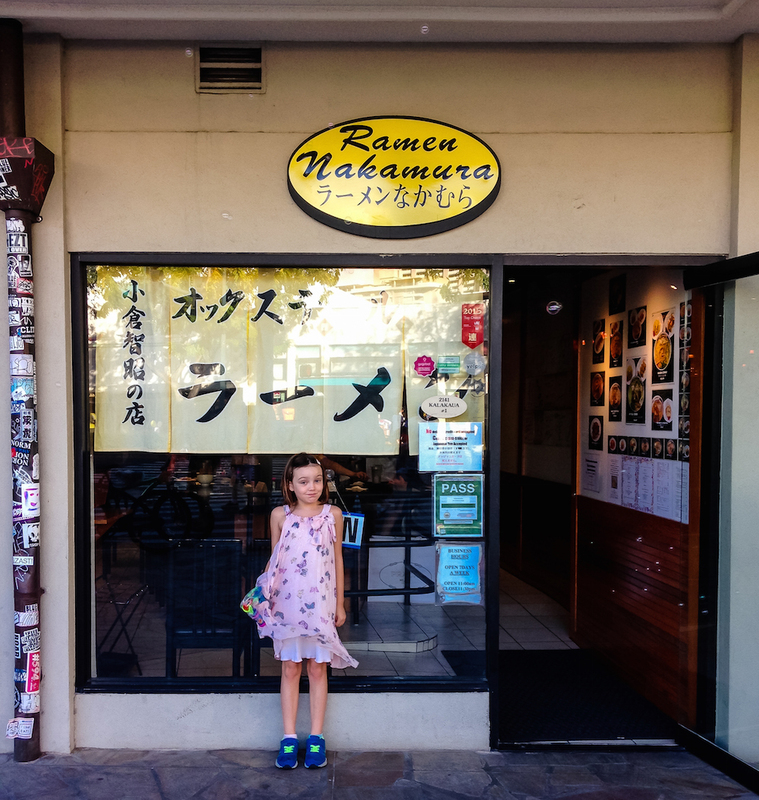 In the end, she didn’t really like SPAM, so we hunted down her favorite food, which is quite easy to find in Honolulu, ramen. After that, we walked on the beach until after sunset, before heading to the hotel. At the Outrigger Reef there was a beautiful Hawaiian band, so we sat and listened to them (scarlet did a little interpretive hula dancing too), before heading off to bed. 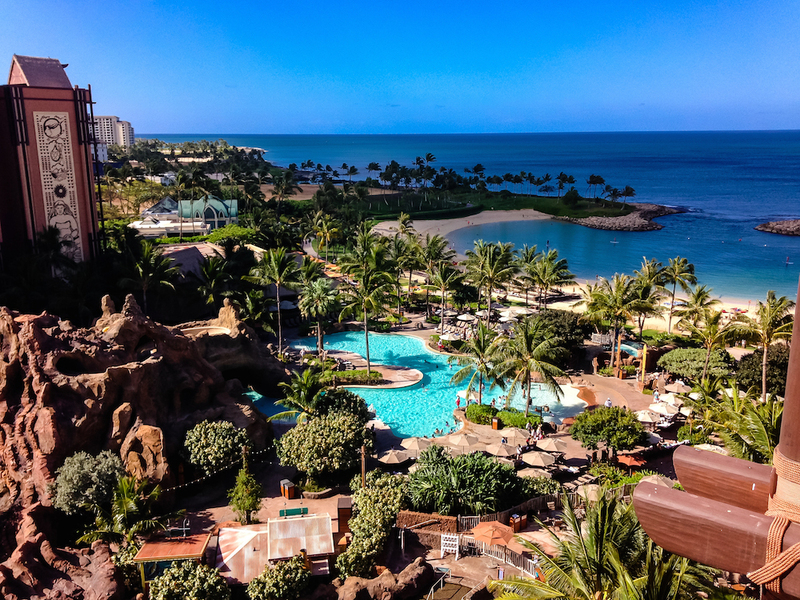 In the morning, we hopped into a rental car and drove up to check out the Aulani. The resort is beautiful! Scarlet certainly enjoyed looking for hidden Mickeys, but they wouldn’t let her play with anything because we weren’t staying at the resort (no day passes are offered, so don’t attempt this on your trip). This is heartbreaking for a kid, so we left with tears and feeling pretty upset. It would have been fun to stay for one night, but it’s too far from everything else for a whole trip, unless you prefer a ‘check-in and don’t leave’ kind of trip. Next time we are on Oahu, I will maybe book our last night here so Scarlet can get her dose of Disney. 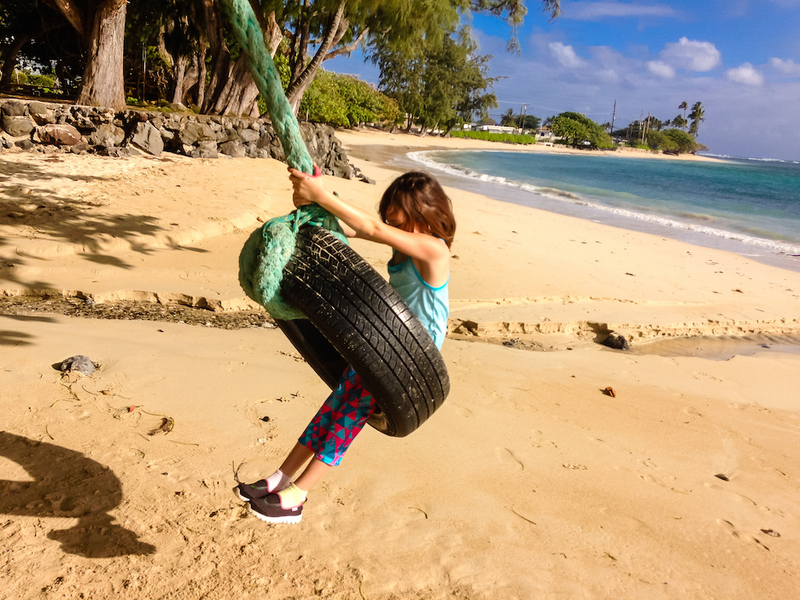 Because this was such a bummer of a morning, we decided to check into the Hilton Hawaiian Village, which has so much fun stuff for kids to do. Scarlet was ecstatic, and enjoyed swimming in all the waterfalls and kid-size slides. 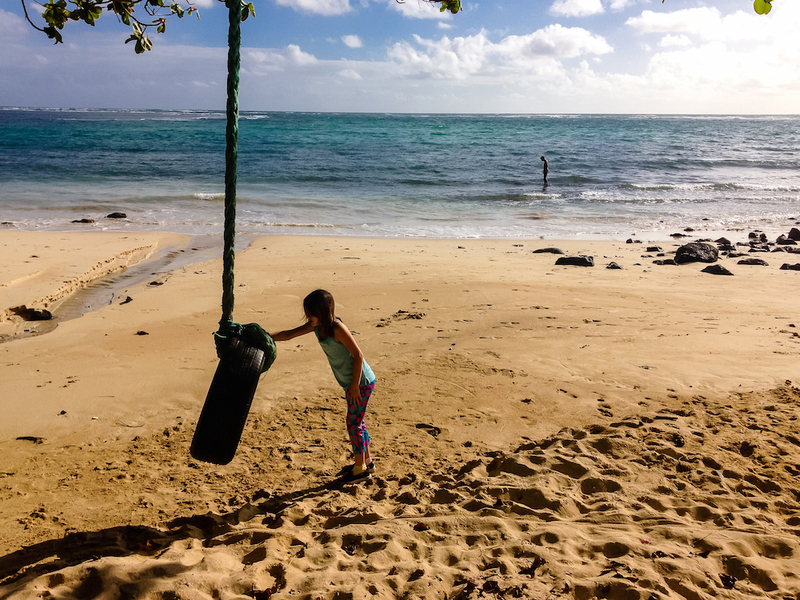 I’ve stayed at the Hilton Hawaiian Village several times over the years, and while it’s very large, it just has everything you need when you are with kids, and it’s on a beautiful stretch of beach. I love it. 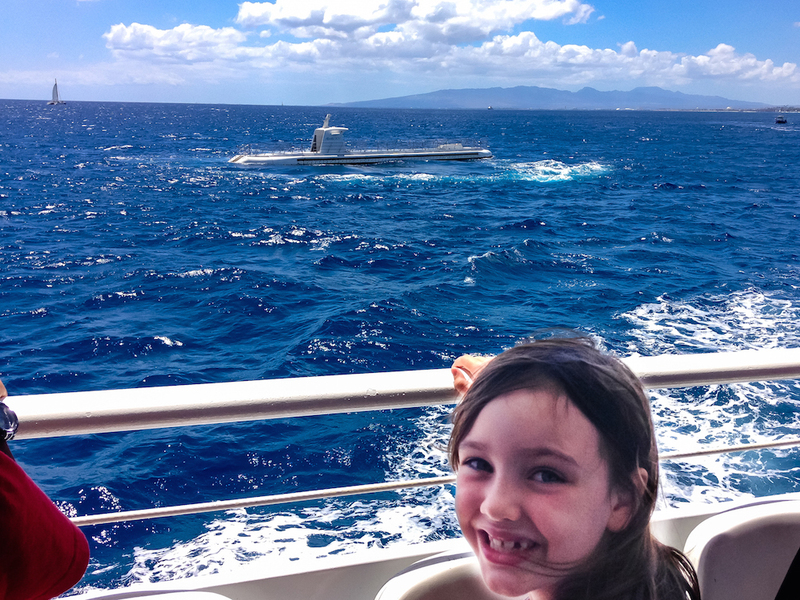 In the afternoon, we took a submarine tour in a real submarine! 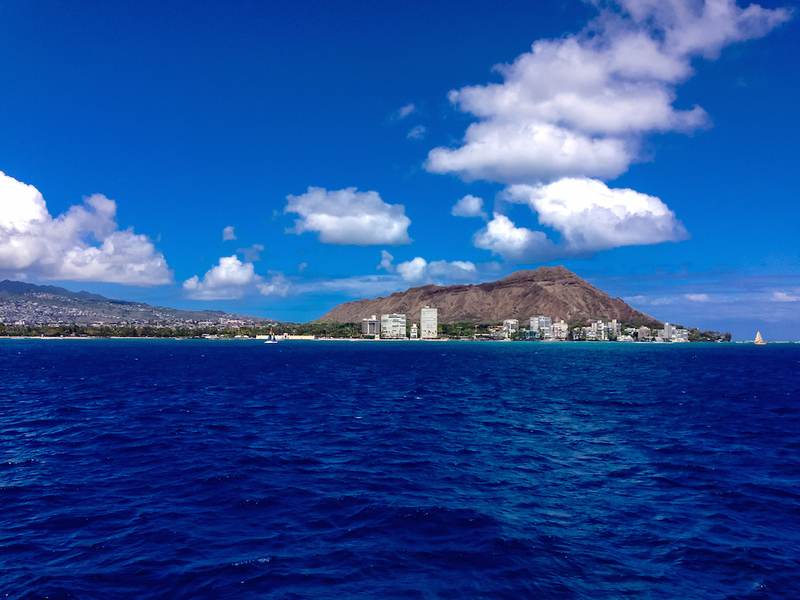 From the dock in front of the Hilton Hawaiian Village, you depart on a ferry over to the Atlantis Adventures submarine tour, then take an underwater tour of the ocean. 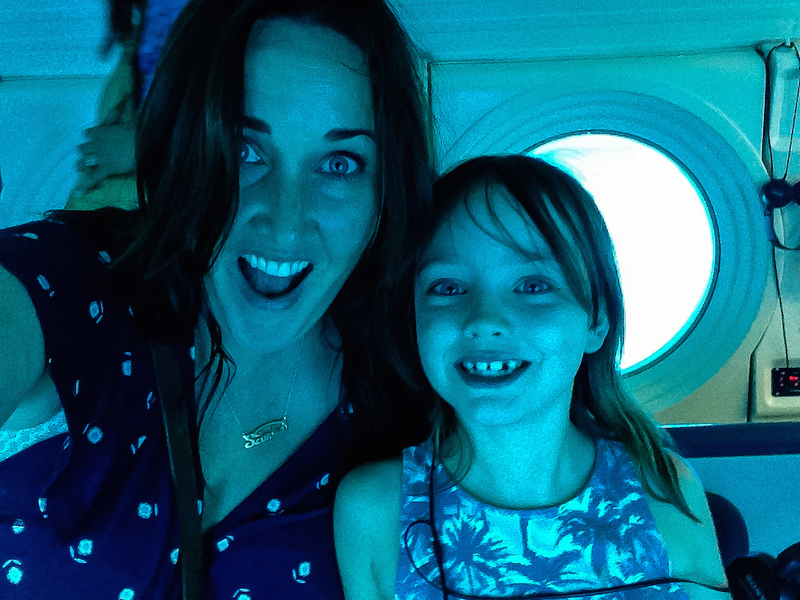 Scarlet was beyond excited (I mean, what is the ocean but a giant aquarium, right?). We saw the submarine surface before we climbed aboard. Then we saw so much wildlife (sea turtles, sharks, so many colorful fish), though I was so busy staring at it, the only picture I took was this goofy selfie of us. 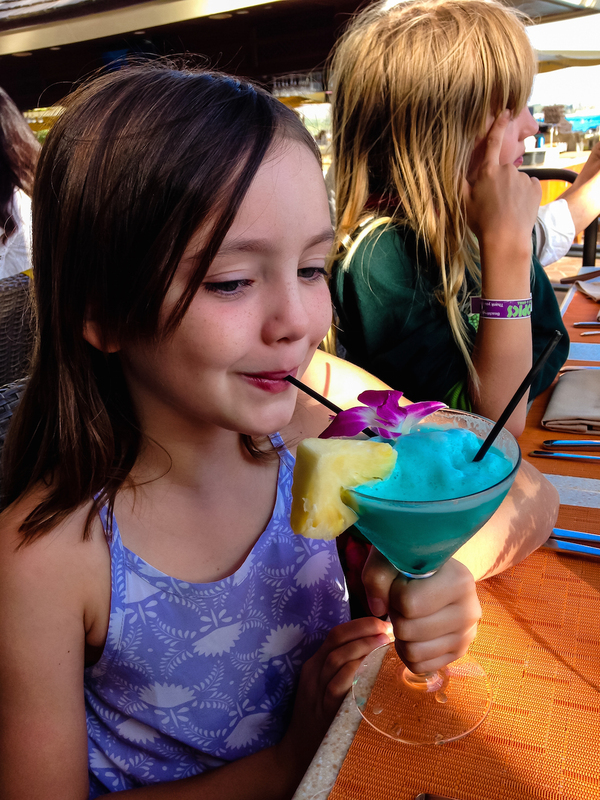 After the submarine, we had a delicious buffet dinner at Kai Market at the Sheraton Waikiki, where Scarlet ate about 252 crab legs and had a mocktail blue Hawaiian. She felt so fancy. Our final full day in Oahu was very magical. 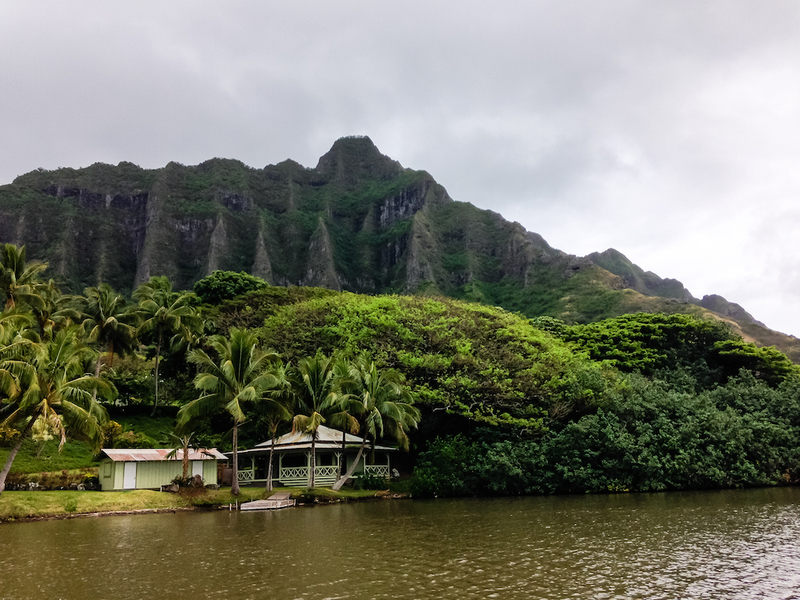 We drove Kualoa Ranch where we checked in for a catamaran tour to a secret island! 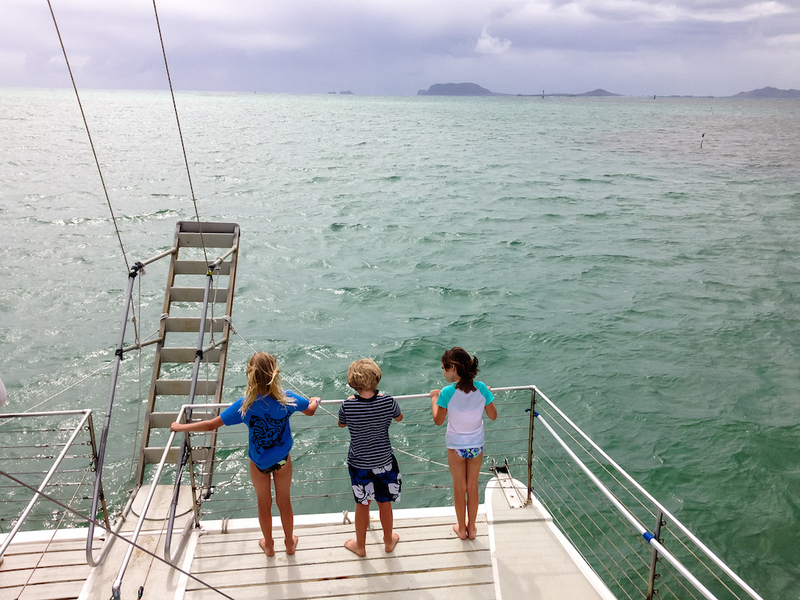 Scarlet made some instant BFFs and they bounced at the front of the boat like adventurers. 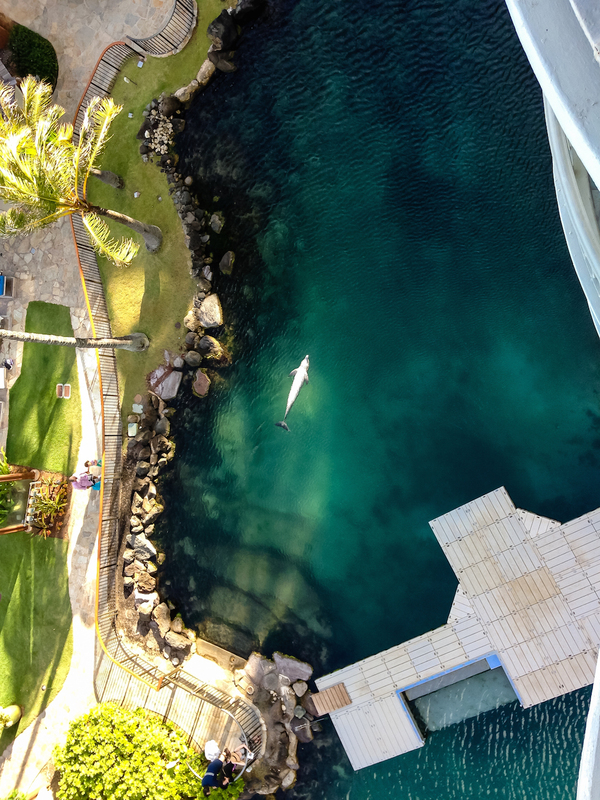 After that lovely morning, we drove to the Kahala Hotel & Resort for some relaxing by the pool before meeting some dolphins. The resort is stunning, so private and luxurious. No wonder the Obamas vacation here. Every president since LBJ has vacationed here, that’s why there is a presidential suite with a secret service suite next door. 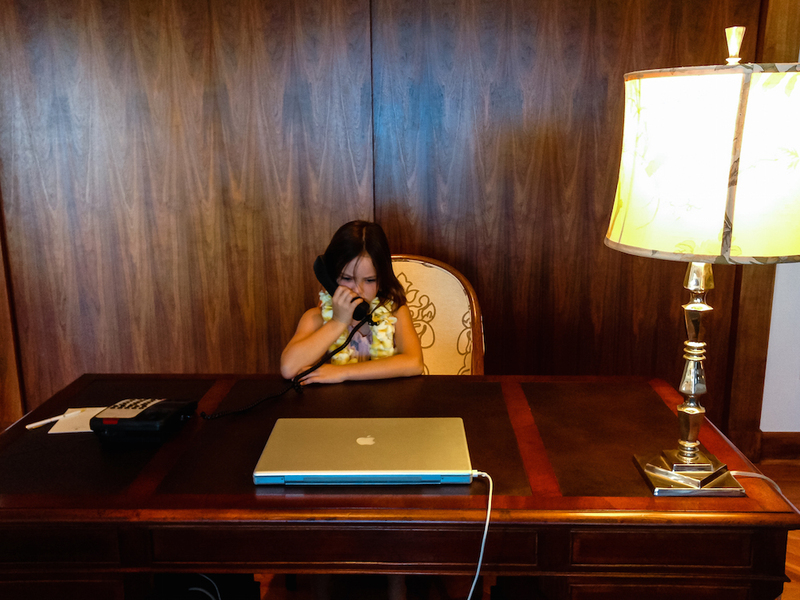 Scarlet pretended to be the president at his office desk. 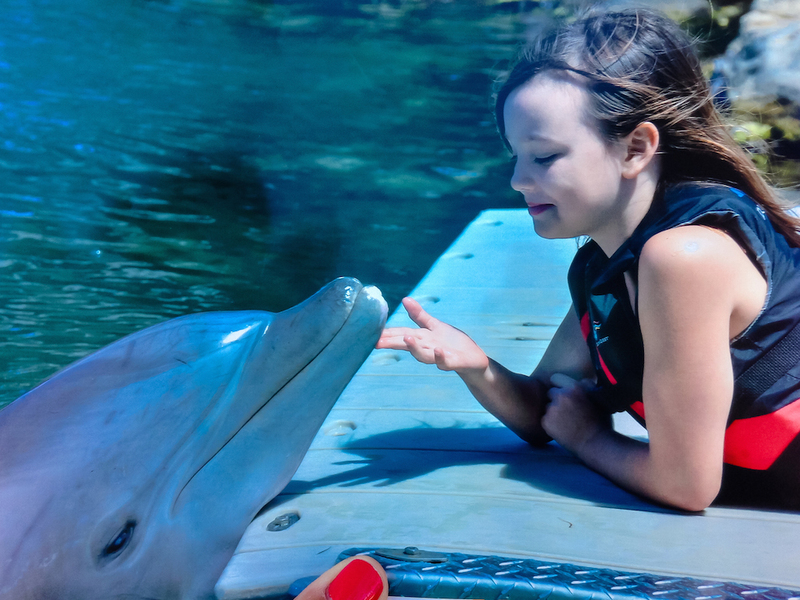 Then, we met some dolphins. That was pretty magical. We finished our evening in the most adorable way. 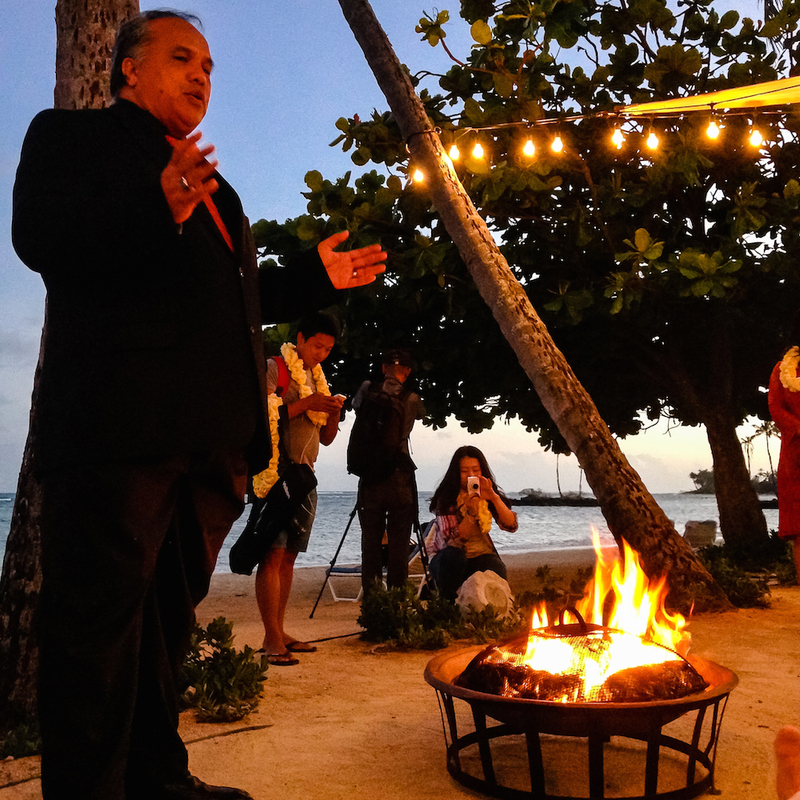 After a gourmet meal of local fish and delicacies, we gathered around a campfire to hear Hawaiian stories and legends. Then the kids went crabbing along the beach, until we all were ready to collapse with exhaustion and smiles. It was hard to say goodbye to Oahu, but I know we will be back one day. Magical photos and a magical trip!